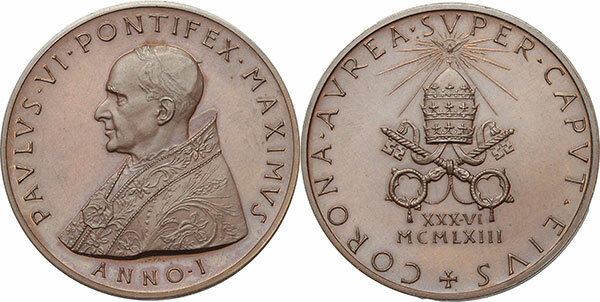 Official 1963 bronze Extraordinary Medal commemorating the coronation of Pope Paul VI which took place in St. Peter's Square on June 30, 1963. Obverse: bust of pope facing left. The reverse depicts the tiara of Paul VI, the last papal tiara worn to date and now on permanent display in the Basilica of the National Shrine of the Immaculate Conception in Washington, D.C. Lovely brown UNC.